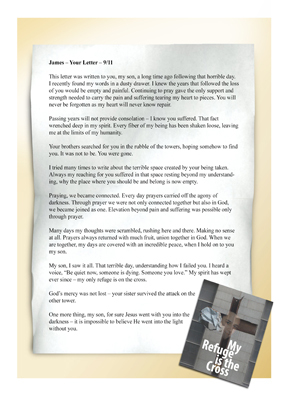 This letter was written to you, my son, a long time ago following that horrible day. I recently found my words in a dusty drawer. I knew the years that followed the loss of you would be empty and painful. Continuing to pray gave the only support and strength needed to carry the pain and suffering tearing my heart to pieces. You will never be forgotten as my heart will never know repair. Passing years will not provide consolation - I know you suffered. The fact wrenched deep in my spirit. Every fiber of my being has been shaken loose, leaving me a t the limits of my humanity. Your brothers searched for you in the rubble of the towers, hoping somehow to find you. It was not to be. You were gone. I tried many times to write about the terrible space created by your being taken. Always my reaching for you suffered in that space resting being beyond my understanding, why the place where you should be and belong is now empty. Praying, we became connected. Every day prayers carried off the agony of darkness. Through prayer we were not only connected together but also in God, we became joined as one. Elevation beyond pain and suffering was possible only through prayer. Many days my thoughts were scrambled, rushing here and there. Making no sense at all. Prayer always returned with much fruit, union together in God. When we are together, my days are covered with an incredible peace, when I hold on to you my son. My son, I saw it all. That terrible day, understanding how I failed you. I heard a voice, "Be quiet now, someone is dying. Someone you love." My spirit wept ever since - my only refuge is on the cross. God’s mercy was not lost – your sister survived the attack on the other tower. One more thing, my son, for sure Jesus went with you into the darkness - it is impossible to believe He went into the light without you.